Our Dominican brother, Fr. Michael Demkovich, OP is the author of this absorbing historical novel of Meister Eckhart, a Dominican friar of the 13th century whose spirituality continues to influence those who study his works. Admittedly, some of Meister Eckhart’s writings are difficult to read as orthodox. To read Eckhart correctly requires a through grounding in Philosophy and Theology. Fortunately, Fr. Michael Demkovich, OP, is proficient in both disciplines and our monastic community has benefited greatly from the lectures he has given to us on Meister Eckhart. 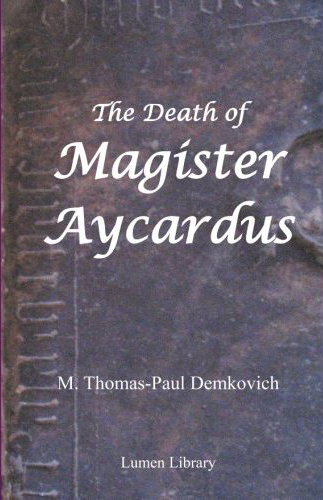 His novel, The Death of Magister Aycardus, reflects his own contemplative insight. Michael Thomas-Paul Demkovich, (1954- ) is a Dominican Friar who has written on Spirituality, Theology & Meister Eckhart in journals and books. He holds a Ph.D. and the Pontifical Doctorate, both from the Katholiek Universiteit Leuven. From 1991 to 1996 he taught at the Dominican Studium in St. Louis, MO before becoming the Founding Director of the Dominican Ecclesial Institute (Albuquerque, NM). In 2009 he was named the Gerald Vann Visiting Fellow at Blackfriars, Oxford. 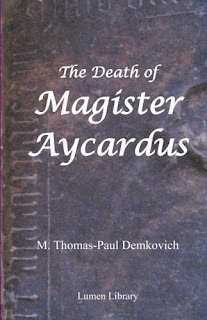 In his most recent work, The Death of Magister Aycardus, he captures the history of the period and the reader’s imagination to create interest and suspense. He is the author of Introducing Meister Eckhart (Ligouri, 2006) and A Soul-Centered Life (Liturgical Press, 2010). We are offering 15% off the regular price for all pre-orders until February 20th at the Gift Shoppe! Blessed Reginald of Orleans: A Second Elijiah!